The appearance was a semi-light brown color with a subtle transparency about it. Slim cap of a little white semi-foamy head slid off at a nice pace. Sly sticky lace. The aroma had sweet freshly cut grass, funky sweet mushrooms, sweet to funky earthiness, hay, basement, and some dried floral qualities. The flavor yields to the funky sweetness and comes to bring in a slight tart edge. Clean floral, hay and cheese-like aftertaste with a touch of twang and enough Belgian malts for an added complexity. The mouthfeel was about medium bodied with a fair amount of sessionability. Good carbonation and ABV felt right. Funky sweet earthy to mushroomy then cheesy and a welcoming earthy clinginess in the finish. Overall, really nice Belgian Blond, I'd have again. This beer pours a rather hazy light brown with a very large head. The aroma offers up a touch of banana and brown sugar, complemented with a great deal of wet hay, dirty rag, and parmesan cheese. The flavor leads with bitter lemon and orange flavor, some barnyard funk, and finishes on a dirty caramel flavor. The mouthfeel is very full and fizzy, light and yet substantial. Overall this is a very nice farmhouse beer, crisp but nice and dirty as well. The youth of Belgium meets the tried and true traditions of the country and culture with a simple ale- one that's effortless in its approach, yet provokes though and contemplation with its understated complexities that come alive with each and every sip. 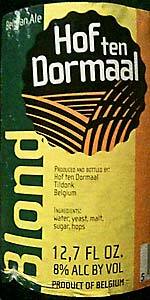 Hof Ten Dormaal's Blond ale pours the expected hazy straw color, billowing with a creamy white cap. Its yeasty perfume wafts over the senses with a host of confectioner's sweet scents, citrus, spice and herbal earthiness. Fresh baking sugar cookies greet the palate with a candied grain sweetness that's shy of honey or dough. Sweetness drifts and the beautiful fruit and spice weave announces itself across the middle palate. Tart green apple, lemon, tart orange and pear align to give the maltiness a candied citrus character. Soon followed by spiciness, the balance comes way of clove, white pepper, vanilla, and a good zesty zing of grassy hops. Brazing bitterness closes with a peppery quality to crispen and tighten its taste late. Light, crisp and carrying a bright effervescence, the ale shows a respectful riesling-like character that amplifies the spice and tartness. Mild carbonated prickle has the malt bouncing off the tongue through a finish of lemongrass, citrus peel and dry hay. Enjoyed from the 12.7 oz bottle in a snifter. This saison with a light twist of the wrapping blew the cork ricocheting into this mornings cup of coffee. Pours a hazy dish water blonde color with a nice head of foam that lingers long till it settles into a thick pool and ring with nice lacing. Nose of yeasty funk, light candy sugars, lemon grass, strong citrus notes of lemon and orange, and mixed spices. Flavors follow the nose with lightly sweet candy sugars that give way to spices of white pepper and an almost basil note, followed by yeasty flavors that give way to citrus flavors and then back to a yeasty aftertaste and warming alcohol. A very big saison in flavor with a highly effervescent mouth feel finishing substantially dry and tart. Nice, but prefer less carbonation and a touch less yeast flavor. Great for what it is, but not my personal cup of ale.